Welcome to Down On The Street, where we admire old vehicles found parked on the streets of the Island That Rust Forgot: Alameda, California. Finally, another Corvette! 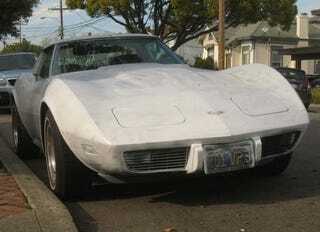 We haven't seen many Corvettes in this series, just this nice '73, this rough '73, and this Malaise-tastic '79. Today's Corvette lives where the '66 Ford Ranchero once parked, so I suspect the Ford's owner has decided to go with a new project. This '77 seems pretty solid, but it has been hit with a coat of some sort of white primer paint.